Facebook is the undisputed leader in the social media industry. The company, which was founded in 2004, has since grown to one of the world’s largest by market capitalization and in terms of the number of active users it enjoys. The company’s growth hasn’t always been linear and of late, it has been rocked by scandals that have caused investor optimism and confidence to waver. However, for long-term investors with a high risk tolerance, Facebook appears to be poised for further growth and today, trades for what can only be considered a trough valuation given its history. 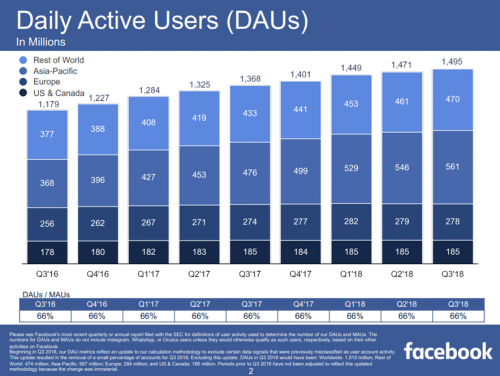 Facebook’s 1.5 billion daily active users dwarfs other social media platforms’ numbers as it has easily supplanted what used to be incumbents in the social media space. Facebook is now the dominant force and its metrics bear this out. The company has over $55 billion in revenue annually, the vast majority of which comes from advertising, and a market capitalization that is near $400 billion even after a ~35% decline from its recent highs. Unfortunately, this year has been one marked by scandals and unpleasant news about the company, including some improprieties from users of the platform and executives fleeing the company. The tough year began with the company’s very unpopular news feed changes, as the company said it would prioritize content from family and friends, rather than from content from brands users follow. CEO Mark Zuckerberg said at the time he thought the change would reduce engagement among users and reduce the time they spent with Facebook, causing investors to question the efficacy of the move. Next came the Cambridge Analytica scandal wherein the British political consulting firm had used the data of 50 million Facebook users to target them during the 2016 US Presidential election without their permission. The scandal shattered confidence in the platform itself and continues to resonate today. This caused both Zuckerberg and COO Sheryl Sandberg to testify before congress, an event that is virtually always a negative for any company asked to go to Washington. The testimonies did nothing to assuage investor fears about Facebook’s ability to control misinformation and improprieties on the platform and shares continued to decline. In late September, Facebook said it discovered millions of accounts that had personal data such as gender, relationship status and recent check-in locations compromised. The company has been engaged in ongoing efforts to secure its users’ data but in light of the other missteps earlier in the year, investors understandably had little tolerance for this news and sent the stock lower still. Finally, Facebook has seen a sizable number of top executives leave this year, including the founders of WhatsApp, Oculus, and Instagram, head of news products, head of security, head of communications and public policy, and others. The near-steady stream of executives leaving the company hasn’t helped investor confidence, but one key figure remains, and that is CEO Mark Zuckerberg. He remains as Facebook’s public face as well as the key driver behind product and strategy, and seems unwavering the in the face of so much adversity. Indeed, we believe that the company’s fundamentals are intact and view these events as learning and development opportunities for Facebook, ones that will shape the future of the company, but not derail its future growth. 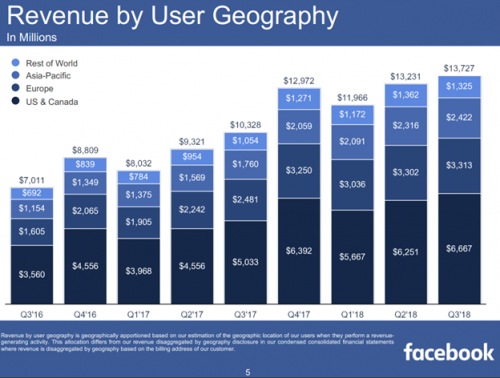 If one can look past all the negativity from unpleasant events that have occurred in 2018, Facebook still has very impressive operating metrics, not the least of which is its immense profitability. The company reported Q3 earnings on 10/30/2018 and results showed once again that the company’s growth is far from over. Earnings-per-share came in at $1.76, an 11% improvement year-over-year. Revenue was up 33% but slightly missed estimates, much to the disappointment of investors. 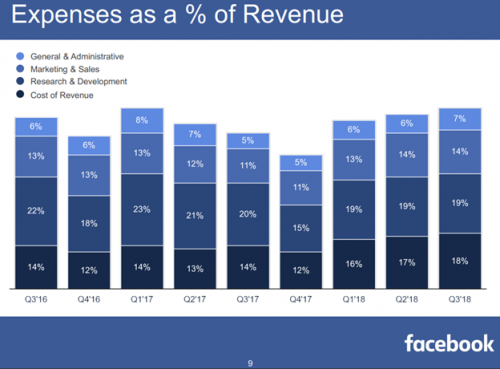 However, keep in mind that expectations obviously needed resetting given that a one-third gain in revenue in a single year disappointed investors; there are thousands of other companies that will never see this sort of growth and it has become the norm for Facebook. Unfortunately, expenses grew much more quickly than revenue, adding 53% in Q3. This kept a lid on operating profits as the company ramped up spending in just about every category. Zuckerberg has warned investors that the coming quarters will be heavy in terms of spending for things like supporting future growth, security, and ensuring that misinformation like fake accounts is minimized. Q3 certainly showed what such an environment would look like as revenue growth far outpaced actual earnings expansion. Indeed, operating margins fell to 42% of revenue from 50% in the year-ago period. However, the company’s user and profitability metrics are still outstanding, and we think it has a bright future irrespective of the events of this year. In addition, revenue by user has expanded rapidly in all geographies, including North America and Europe, and this will help revenue expand over time as well. In addition to revenue growth, this should help boost margins as incremental advertising revenue will help leverage down operating costs and thus, improve profitability. This slide, perhaps more than any other metric, shows the reason why investors are selling Facebook shares this year. The company’s expenses rose sharply in Q3, as noted above, thanks to increased spending on marketing, general and administrative costs, and higher cost of revenue. Facebook warned investors expenses would be rising and they certainly are, but given management commentary, we also believe this increase in spending to be temporary, coming into play to address specific issues the platform has today. At some point in the future, this increased spending won’t be necessary, and margins will reflate again. The decline Facebook has seen in its share price this year has it languishing near its 52-week lows. Analysts continue to expect $7.38 in earnings-per-share for this year and a similar amount for next year thanks to the higher expenses mentioned above. That puts the company’s price-to-earnings ratio at just 18.7, which compares extremely favorably to its 2017 average price-to-earnings multiple of 25. While the earnings growth outlook has changed since 2017 given all of the above, not the least of which is higher spending, the reduction in the earnings multiple is understandable. However, we also believe that earnings growth will be back on track in 2020 after upgrades to the platform are made and as revenue continues to grow. As a result, we see Facebook shares as undervalued and over time, we believe they will achieve a price-to-earnings ratio in the mid-20s once again, offering investors a significant tailwind to total returns. Facebook, however, is not for the risk-averse investor. The social media space in general is a rather treacherous place to invest as the stocks of these companies tend to be quite volatile. Indeed, Facebook investors have experienced that in 2018. However, compared to its historical valuations, Facebook shares look very undervalued. We see Facebook as an attractive play on social media growth in the coming years trading for a reasonable price, something which doesn’t happen often. However, given its short history as a public company and the uncertainty facing it operationally, this is only for investors with a very high risk tolerance.